Observed at the South Rim of the Grand Canyon in ponderosa-piñon forest, Coconino Co., Arizona. 11 Oct. 2012. FLOWERS: The small flower heads are borne in abundance on numerous slender stems. The colors change with maturity from cream-yellow, tinged with red, green and finally gray-brown. 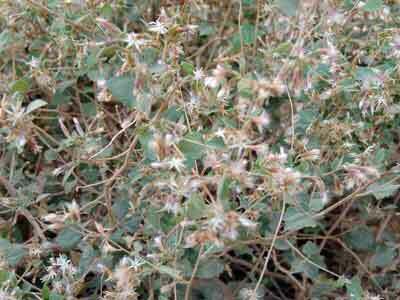 LEAVES: The leaves are triangular and set with short, dense pubescence; the margins are round-toothed. PERENNIAL: The upper portions of the bush are herbaceous while the lower tangle of stems are tougher and slightly woody. Most plants are about a meter tall. RANGE: Found on rocky slopes and forest edges throughout much of southwestern North America. 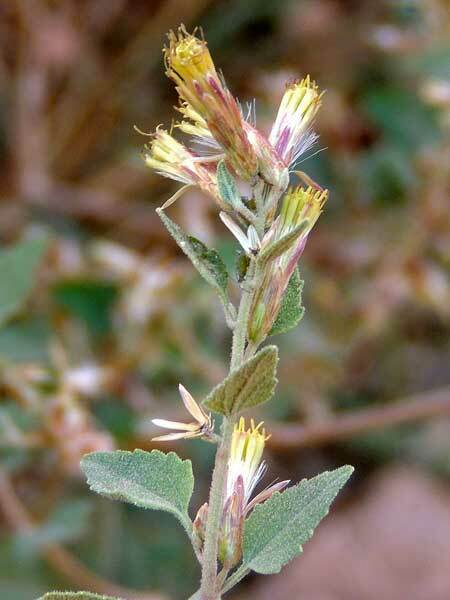 There are some 23 other similar-looking brickell bush species described from Arizona. FRUIT: The seeds are topped with plumose bristles and the empty seed heads are dry, papery and light brown.